Originally published in 1926, this textbook was aimed at first-year undergraduates studying physics and chemistry, to help them become acquainted with the concepts and processes of differentiation and integration. Notably, a prominence is given to inequalities and more specifically to inequations. 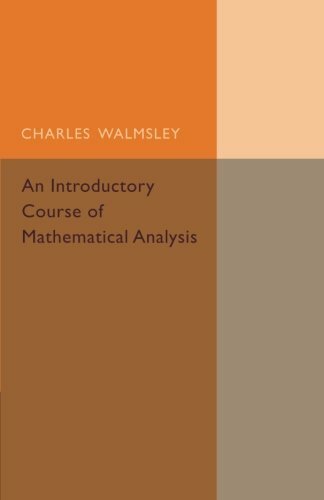 This book follows the release of the author's Mathematical Analysis I and completes the material on Real Analysis that is the foundation for later courses. The text is appropriate for any second course in real analysis or mathematical analysis. Interactive Real Analysis is an online, interactive textbook for Real Analysis or Advanced Calculus in one real variable. It deals with sets, sequences, series, continuity, differentiability, integrability, topology, power series, and more. The text is designed for an introductory course in real analysis suitable to upper sophomore or junior level students who already had the calculus sequel and a course in discrete mathematics. The content is considered a moderate level of difficulty.